I've been thinking a lot about mindfulness and meditation (been mindful about mindfulness?). Based on ancient Eastern philosophy and largely poopooed by the West until recently, we can finally see the 'science' that 'proves' it works, and so it's all the rage in the therapeutic community. I am feeling increasingly uncomfortable with the fad-like nature of the increase in popularity. I'm not entirely sure it will integrate healthily into our collective psyche in a truly evolutionary way but rather, be a passing fashion that gets replaced by the next big thing in self-help. Which would be a huge shame. But, I would like to find a new word for mindfulness, one which doesn't have the connotations of the white, middle class, middle aged "worried well" and links it back to its roots based on universal truth and the sharedness of human existence. Of course the roots are attached to that scary, airy, fairy concept SPIRITUALITY, which means that it can't possibly be marketed to theophobes...Whilst I'm on that topic I consider myself an atheist, possibly agnostic, veering towards pantheistic...the point is, my own spirituality is organic, developing, work in progress. I am secure enough in my stance to invite and welcome other frames of reference, especially if there's usefulness and learning attached. 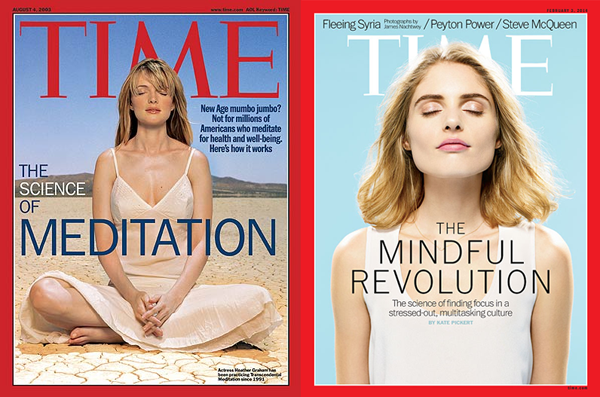 I believe that there are many of us out there able to deal with the spiritual frame of reference associated with meditation, and to incorporate something that science has finally proven has benefits, without making it into a glamourous, de rigueur fad, that somehow takes the essence out of it.